Could you explain a little about your background and how you came to live in Belfast? I am Lebanese, genetically. I spent a lot of time in the US. I decided to make changes in my life and re-orientate towards education and through that decision I was accepted into a Master’s Degree programme at Trinity College Dublin. That programme was initially hosted in Dublin, and that suited me because I found living there relatively straight forward because the cultural reference points of the city were, broadly speaking, similar to what I was accustomed to. I was then informed that the course was to be maintained in Belfast. Now, Belfast was never on my radar. I associated the place with conflict if I associated it with anything at all, although to be truthful Belfast was really nothing more than a passing phrase, given that Dublin suited me quite well in terms of my general orientation. So I moved to Belfast to continue my education, a Master’s degree and then once that was finished I was accepted into a PHD programme and so I have stayed here. Where does your interest in Street Art originate? I have been interested in Street Art since my family moved back to Lebanon in the 1990’s and there are interesting reasons why that developed. When I moved back to Lebanon, it was after the conflict had finished and I felt that I really couldn’t connect with Lebanon. Although I am Lebanese by birth, I had never really lived there and if you weren’t part of the conflict you could be seen as “the one that got away” and not in a romantic sense, but rather you escaped the conflict and so you didn’t experience what everyone else experienced and was still reeling from when we moved back. The other question I was facing was that in order to be part of a movement for social change what areas or arenas will I be able to partake in. So I threw myself into organising around LGBTI rights. I wanted to be part of creating a new narrative and part of what informed my thinking was that I understood from a very young age that there is a dynamic between you, your surroundings, and your built environment which shapes you. I also thought that however you view yourself and your ideas personally, young, educated, urban, city dweller is also conditioned by the contemporary social and political conditions which you are part of or are experiencing. 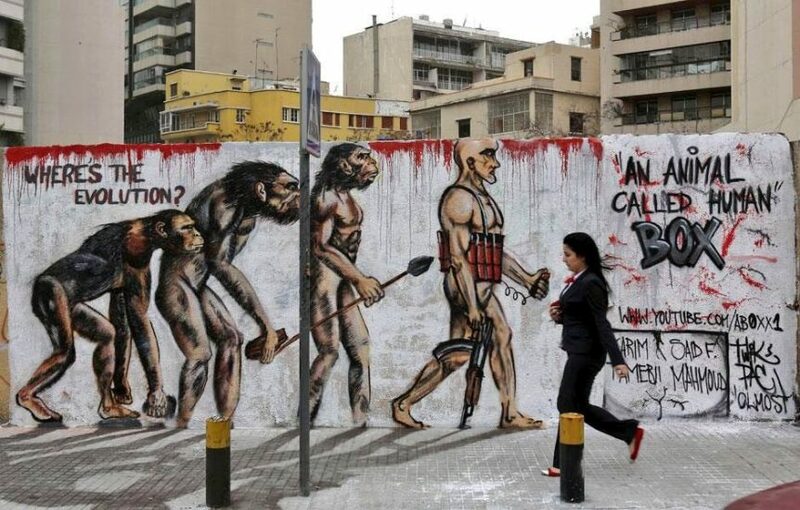 So you are questioning your life and life around in Lebanon and Street Art impact your thoughts at this point? With regards Lebanon, the fighting had been very brutal in the 70’s at the height of the conflict, and the impact of that on the people I was interacting with impacted me. I also became interested in quirky interventions on the built environment, on the landscape. I liked the idea that I could be part of organising activities around what were for me key issues and I always wanted to be part of making things happen; campaigning for change. Part of the initial thought processes had to do with understanding what is it to be gay, or queer, or not heterosexual in a place like Lebanon. Even being heterosexual in Lebanon is quite differently understood or performed there, with regards displays of affection, of honour; familial relationships are quite differently practiced in Lebanon compared to here. Sexuality is very enclosed in Lebanon. Sexuality generally is very closeted. So many people thought that we, homosexuals, should stay in the closet. So the social relations generated by the conflict were at some point requiring a challenge. And I was part of that process. And how does Street Art fit in here? I started to appreciate art at a very young age. As I developed I found that was attracted to installations which lay claim to areas of cities. Where people intervene on, and in, the spaces of cities. 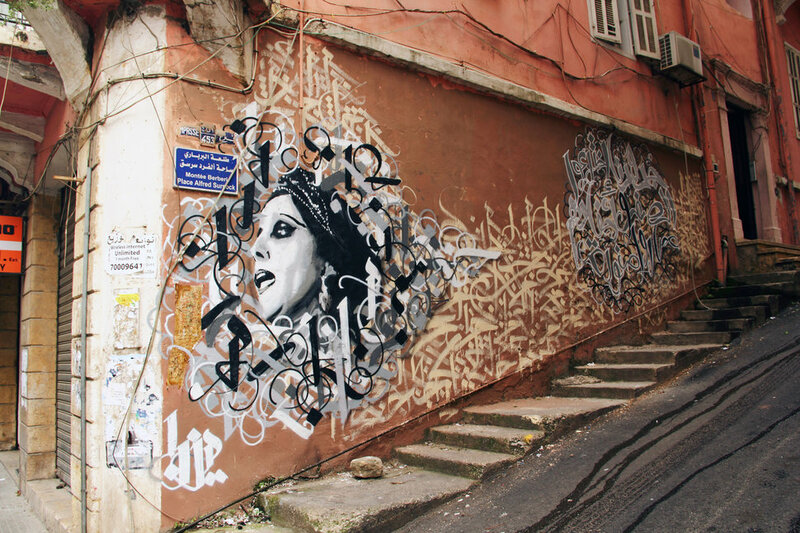 In Lebanon art on the streets challenged people’s perceptions of what it was like to live in a post conflict society and this was entwined with the struggle for rights; women’s rights, LGBTI rights, even simple and basic human rights. It was the artists, and in particular street artists, who were offering the possibility to think about new experiences in a world which was very structured, very rigid, where expectations of how one might live their life were very prohibitive. And I thought that the street art was very poetic in that environment. Did you produce Street Art yourself? I am not an artist. That is very important for me to say. I am not trained or schooled in technique nor do I have an artist’s orientation, however, as I said, I understood at a very young age that art could impact the world. With regards Street Art, one of the things that attracted me to the form was that I am process orientated. I like to understand the journey, the steps taken to achieve something. I believe we live in a world where people are forced to look only at the end product. In general people have been forced to be consumers. But Street Art defies that narrative. It is sometimes transitory, sometimes explosive and dynamic, almost always intensely political and almost always requires a journey, a struggle to realise itself. So this brings us to Belfast. With regards the Street Art in Belfast, again it interests me immensely. Hit the North is Ireland’s largest Street Art Festival. When you speak to the organisers the key elements which they suggest, motivate them is that they are opposed to the corporatisation and the impact of globalisation on their city. They also want to look at the question of how this city has used street art, murals, the political orientation which these have had and they want to challenge those social dynamics, the corporatisation of the city and the politicisation of street art in a particular direction. They would say to you, “why should art only be allowed to be viewed through one prism”, i.e. the political murals. From my perspective that orientation excites me. I think that as far as I am aware it is only in the Northern Irish context that a mural is specifically a piece of political art and a particular type of political art i.e. mostly conflict connected. And what do you think about the Street Art in Belfast? For me, there are a couple of things to say about the street art here. As a form it is highly unregulated i.e. all manner of forms appear on areas throughout the city, massively distinct from gallery art or the usual displays of what is termed high art. This is a brilliant thing for a city like Belfast. There is always an element which emerges in discussions with people who are from Belfast, people who have always lived here and often people who were born here and have left and then returned, and that is “how do we reclaim this city?” This comes up often in discussions I have had with artists working here. So the street art scene here is challenging the general political orientation. The street art scene here, no matter how it has been established, challenges almost all the elements of what might be described as the culture of Belfast, put crudely, “religion, sectarianism, conflict, more conflict, no immigrants, no gays, white men dominate, women are subordinated to that”. The art and the artists challenge that narrative. There has been a journey; Hit the North may be the catalyst which brings the various strands of Street Art to the surface, but there was a graffiti scene here, there were discussions as far back as a decade ago, but Hit the North has cemented an above ground orientation. Within that there are a lot of discussions which can happen now which might not have occurred before the festival emerged , what makes something street art and not graffiti?– is graffiti a valid art form which deserves recognition in the way street art seems to have managed to achieve/ and many more questions beyond that. On that basis I find, much as I did in Lebanon, Street Art in the Belfast context to be very exciting and we should all be thankful for that.